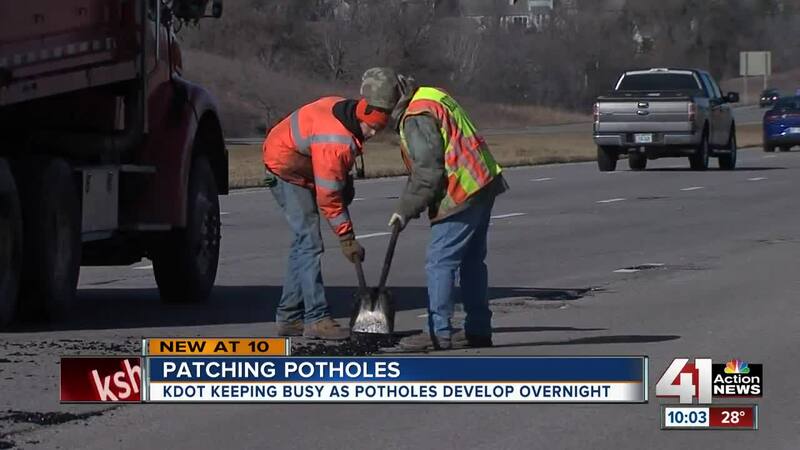 The Kansas Department of Transportation is patching a lot more potholes than this time last year. LENEXA, Kan. — The Kansas Department of Transportation is patching a lot more potholes than this time last year. From October through February last winter, KDOT used 2,308 tons of patch material. Already this season, the agency has used 3,313 tons of patch material. That's a 43 percent increase. "It's hard to explain to people that we've already been out there even before these last couple of storms patching holes and then some of that freezes and comes out or we plow it out with a snow plow. It's hard to convince people we've been out there doing it," KDOT Equipment Operator Specialist, JJ Konrade said. Dajona Graves hit a pothole in Kansas City and got a flat tire because of it. "I drive that way every day and it's like four or five holes. I've seen multiple cars swerving to try to pass them up and then other ones who are not willing to swerve and put other people at risk just run over it," she said. KDOT says potholes can open up overnight, and water setting in and refreezing only makes them larger. Not to mention, crews cannot plow snow and patch potholes at the same time. Konrade said, "Got to come back in and take off the spreader and plow and everything that we did for that. Then, we have to take that off and get ready for patching, load the trucks. Then we lose manpower because the people that worked overnight have to go home during the day and get rest." This winter is really taking a toll on crews. "We've worked overnight and during days for these last couple of storms. Everybody is starting to wear down and yea, it's wearing on us," Konrade said.